Suitable for the Xbox 360. LEGO The Lord of the Rings is based on The Lord of the Rings motion picture trilogy and follows the original story lines of The Lord of the Rings: The Fellowship of the Ring, The Lord of the Rings: The Two Towers, and The Lord of the Rings: The Return of the King. Now the entire family can team up in pairs as adorable LEGO The Lord the Rings mini figures to experience countless dangers, solve riddles and battle formidable foes on their journey to Mount Doom. LEGO The Lord of the Rings takes players along on the adventures of Frodo Baggins and his unlikely fellowship as they set out on a perilous journey to destroy The One Ring and save Middle-earth. Kids, tweens, teens and parents can traverse the Misty Mountains, explore the Mines of Moria, knock on the Black Gate of Mordor, and partake in epic battles with Orcs, Uruk-hai, the Balrog and other fearsome foes while harnessing the humour and imagination of LEGO game play to solve puzzles and explore Middle-earth. Players will take on the form of their favourite members of the fellowship – Frodo the Hobbit, Aragorn the Ranger, Gandalf the Wizard, Legolas the Elf, Gimli the Dwarf, Boromir a Man of Gondor, and Frodo’s Hobbit friends Sam, Merry and Pippin – as they relive the most momentous events from the films. For ages 7 years and over; EAN/MPN/UPC/ISBN: 5051892113977. * 9105315 27.99. This toy costs approximately £24.99 (for the latest and best prices make sure you check our retailer list for the LEGO Lord of The Rings X360 above). 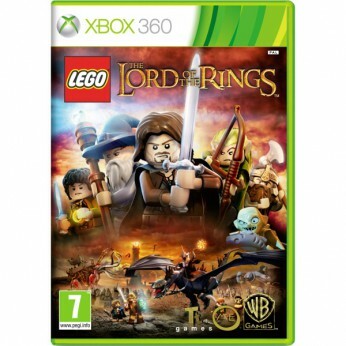 In our review of LEGO Lord of The Rings X360 we classed it as being suitable for ages 8 years, 9 years, over 10 years, Teenagers but recommend you check the manufacturer specific advice before purchasing.